Among the 66 cleantech projects that received ARPA-E grants, General Electric’s fabric wind turbine blade is one of them. This developing project is a good sign for wind energy, as it could help wind energy become more competitive with fossil fuels. The blades have the same underlying structure as a standard wind turbine blade, but rather than using fiberglass in the design, a strong architectural fabric is wrapped around the frame of the blade. GE says the blades will perform just as well, and the lighter material will leave room for longer blades that capture more of the wind’s energy at possible price reductions of up to 40%. This means wind power could soon compete with fossil fuel rates without dipping into government subsidies. Current turbine blade designs have length restrictions due to the weight, and the costs are astronomical. The molds alone for fiberglass turbine blades cost millions of dollars. 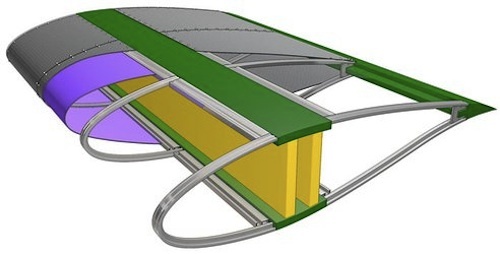 These lightweight fabric options open doors for an entirely new line of wind turbine that will capture energy from slower wind at much more affordable prices. The blades will also be constructed on-site rather than at a factory, so transportation costs will also be smaller. GE says these new blades will be rugged and long-lasting, with no regular maintenance needed over the 20-year lifespan. Do you think this new wind turbine design could be the breakthrough wind power needs?